This year’s theme (Building Bridges – Enhancing Multistakeholder Cooperation for Growth and Sustainable Development) is extremely relevant in light of the many challenges faced by the Internet since we were last together in Baku. I would like to be able to talk to you about important work going on across the Internet organizations and community — such as efforts to bring the remaining 4.5 B people online, or to reduce operating costs in developing countries by supporting IXPs, or to help the developing world get ahead of spam, something we heard clearly was a problem at last year’s WCIT, or to increase local content, or improve security through efforts to deploy DNSSEC, RPKI or email authentication, to list only a very, very small number of activities; however, there is a cloud over all our efforts. The widespread covert government-sanctioned surveillance activities recently revealed have provided new challenges to all of us – alarming challenges. Any actions – even those justified on the grounds of national security – that interfere with the privacy of its own citizens or of other nation’s citizens is wrong. Many of the ideas being promoted in response to these surveillance issues support a reductive model with a focus on security, risk mitigation or control through digital borders, and this is worrisome. 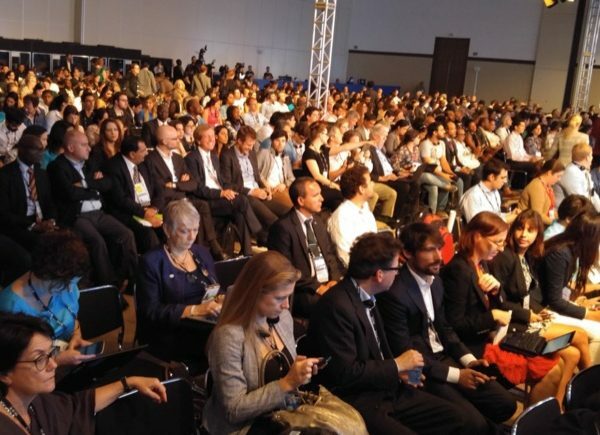 The so-called “technical community” is fully engaged in the debates, and earlier this month, the Internet Society convened many of the leaders of these technical organizations in Montevideo, Uruguay. We reinforced the importance of globally coherent Internet operations, and warned against Internet fragmentation at a national level. We expressed strong concern over the undermining of the trust and confidence of Internet users globally due to recent revelations of pervasive monitoring and surveillance. We identified the need for ongoing effort to address Internet Governance challenges, and agreed to catalyze community-wide efforts towards the evolution of global multi-stakeholder Internet cooperation. and, we called for accelerating the globalization of ICANN and IANA functions, towards an environment in which all stakeholders, including all governments, participate on an equal footing. We also noted that the Internet and World Wide Web were built and governed in the public interest through unique mechanisms for global multi-stakeholder cooperation, and that this has been intrinsic to their success. We discussed the clear need to continually strengthen and evolve these mechanisms. We all want a robust, sustainable, secure Internet. And, clearly, there are areas that are still challenging. If they were easy problems, they would be solved by now. But many are difficult or complex to solve – they impact or implicate many different stakeholders or involve many disciplines or types of expertise. Mobilizing Collective Action: Issues for which we believe there are answers, but require more time and buy-in. For example: DNSSEC – which is not useful until much of the DNS is signed and resolvers are validating responses. Collective Behavioural Change: Issues which require others/multiple parties to change operations, habits, etc. For example: Privacy, Intellectual Property Rights, etc. Disputed issues: Issues for which there is not general agreement on the problem. An example: Operator business models — concerns that “sender pays” is the only model that works for access network operators, matched by realization that such a model would cripple innovation on the Internet. To successfully tackle these difficult or persistent problems clearly requires multi-stakeholder cooperation and flexible approaches. In closing, we are all helping to build the Internet of the future, whether building physical networks, defining policies, creating standards, participating in the IGF, or building multi-stakeholder consultative or consensus processes. We are all working to build the future – there is really no status quo, it is a continual evolution. Returning to more traditional roles for governments, private sector, civil society, or the technical community is not feasible; the proverbial horse has left the barn. Over the course of this week, we will have the opportunity to talk, to listen, to share experiences and best practices, and to shape decisions that will impact the future of the Internet. The Internet Governance Forum (IGF) is, indeed, more relevant and essential than ever before. It is our strong plea that here at the IGF, we show an increased commitment to a distributed, de-centralized model of Internet Governance, and that we all work to strengthen the IGF, to put it on a stable and sustainable basis, and extend the mandate beyond 2015 – for the future of the Internet and the benefits it can bring to all of us.